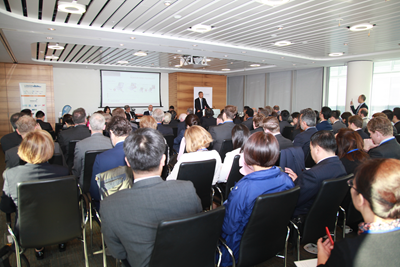 It is a real delight to join you at the "Belt and Road" breakfast meeting of the London International Shipping Week 2017. My speech today will focus on China's Belt and Road Initiative and China-UK shipping cooperation. The 21st century is a century of the sea. Maritime navigation is one of the greatest inventions of man. As a result, the oceans are connected, the distance between countries shortened, and the communication and interaction between different civilizations greatly enhanced. It is estimated that shipping accounts for over 80% of global trade in goods. Therefore the shipping industry is an important vehicle for economic globalization and a pillar for worldwide growth. Britain is the birthplace of the modern shipping industry. You have a comprehensive industrial chain, diverse sectors and a rule-based management system. London has long been a leading global center of shipping, finance, legal services and insurance. 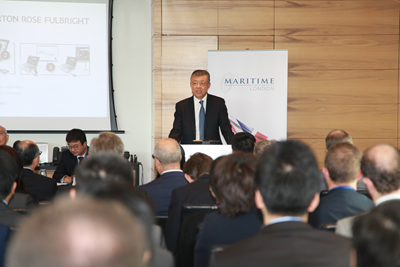 London is also an information hub and a leader in professional services for global shipping. Outside this window is the river known as the "history that flows". The Thames that has nurtured the British civilization also witnessed the rise and growth of international shipping. China is an ancient civilization with a long history of shipping and navigation. More than 2,000 years ago, Chinese people were already navigating the oceans. Ancient shipping routes later became the "maritime silk road". This started from China's southeast coast and went down the coast of IndoChina Peninsula and through the islands of the South China Sea into the Indian Ocean. It then sailed down the coast of East Africa and entered the Red Sea before reaching Europe. This "maritime silk road" is a major passageway of trade and culture exchange between China and the rest of the world. It had brought prosperity and wealth to the countries and regions on its routes. The historic cities of Baghdad and Constantinople, and maritime ports such as Colombo, Jeddah and Alexander started to rise. They became cosmopolitan commercial hubs where merchants from different part of the world gathered and traded. First, the Belt and Road Initiative has given a strong boost to global trade. At present, the world economy faces many difficulties and uncertainties. Trade in goods remains sluggish. The international shipping sector has also suffered. Within this context, China proposed the Belt and Road Initiative four years ago. Since then, this initiative has received enormous enthusiasm and brought tangible benefits to countries along the routes. The building of the Belt and Road follows the principle of broad consultation, joint contribution and shared benefits. It is an initiative of the people, by the people, for the people. Over the years, China has worked with countries along the Belt and Road routes to increase market access and improve trade facilitation. From 2014 to 2016, trade between China and these countries exceeded three trillion US dollars. A number of landmark projects are making good progress. By June this year, Chinese companies have set up 56 economic and trade cooperation zones in 20 countries along the routes. This has generated over 1 billion dollars in tax revenue and created 180,000 jobs. China also signed free trade agreements with a number of the countries in this region. Now we are pushing for negotiations on Regional Comprehensive Economic Partnership, or RCEP, to promote unimpeded trade and to deepen business cooperation. In May, China successfully hosted the Belt and Road Forum for International Cooperation to map out Belt and Road development phase II. It is my firm belief that the Belt and Road Initiative will build up new momentum for global trade. Second, the Belt and Road Initiative has forged closer ties between the shipping sectors of different countries. As of May, China has signed bilateral maritime agreements with 36 countries along the Belt and Road routes as well as the EU and ASEAN. Now we are implementing these agreements, including mutual port services and tax preference, and exchange of representative offices. Together with the EU and ASEAN, we have set up regular meeting mechanisms to discuss the various aspects of the shipping industry, including further development, policy-making, market supervision, safety and security, environment protection, personnel training, etc. We have agreed on specific cooperation in some key areas. Going forward, China will engage the countries along the routes in more concrete cooperation in the field of shipping. We will encourage shipping companies to open up new lanes and increase the number of shifts. We will join hands with countries along the routes to improve the service network. We will work with international organizations and enhance bilateral and multilateral cooperation mechanisms to ensure safe and secure passageway. This includes more in-depth participation in the IMO affairs and shipping security cooperation. Third, the Belt and Road Initiative has promoted connectivity of worldwide shipping infrastructure. Ports and harbours are key infrastructures that link up coastal regions with the rest of the world. Connecting these infrastructures in an effective network can significantly boost social and economic development of coastal regions. China's shipping sector has achieved rapid development in recent years. This is largely attributed to China's all-out efforts in building infrastructure. According to last year's statistics, seven of the world's top ten biggest container ports are in China. China is home to 34 large ports with freight volume at or above 100 million tons, and 2,317 berths capable of accommodating at least 10,000 tonners. By the end of this year, upon the completion the phase IV of Shanghai's Yangshan deep water port, the world's largest and most advanced automated container wharf will be put into test run. Such rapid progress is a symbol of China turning from a big shipping nation to a major maritime power. China is also cooperating with countries along the Belt and Road routes to accelerate a series of large-scale infrastructure projects. Gwadar and Piraeus projects are making good progress. More large projects are in the pipeline. The Belt and Road Initiative will also focus on connectivity of highways, railways and port networks. Improved infrastructure will significantly contribute to the development of the world's shipping industry. Fourth, the Belt and Road Initiative serves as a new platform where China and Britain could join hands in developing our shipping industries. Britain is China's key partner in building the Belt and Road. Not long ago, President Xi Jinping and Prime Minister Theresa May met during the G20 Hamburg Summit. The two leaders reaffirmed their shared commitment to building the China-UK "Golden Era". China-UK cooperation on the Belt and Road is a major "golden fruit" of this "Golden Era". A number of big projects such as the Hinkley Point C nuclear power plant and the ABP Royal Albert Dock are making good progress. Two-way freight trains have started to run between London and China's Yiwu. Bilateral cooperation on trade and investment has maintained a high level. Cultural and people-to-people exchanges have been closer than ever before. These laid solid groundwork for China-UK shipping cooperation within the framework of the Belt and Road. China is a big trading and shipping nation while the UK is a global centre for shipping services. 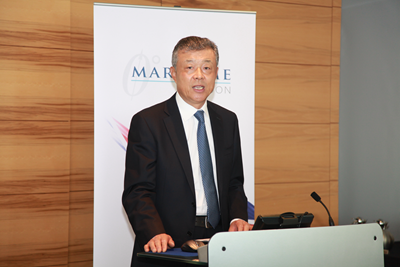 Chinese and British shipping sectors have much to offer to each other. As natural partners we have a bright future for cooperation. We should continue to strength cooperation on shipping-related finance, law, disputes settlement and insurance. Our joint endeavour in the shipping cooperation will be a new highlight of our cooperation on the Belt and Road. An ocean can never be vast without the contribution of every single stream and brook." As we mark 45 years of China-UK Ambassadorial diplomatic ties and work to consolidate the China-UK "Golden Era", we should build on what we have achieved and focus on accumulating every single step of progress. Let's join hands to seize the historic opportunities to advance China-UK shipping cooperation and to contribute our part to the building of Belt and Road. Finally, I wish this year's London International Shipping Week a complete success.